I am looking for a copy of one of Patrick’s stories that was in Outdoor life entitled “shooting the chicken out narrows”. It would have been published around 1975… I remember the approximate date because I almost fell out of my recliner laughing!!! I have five of his books, but these are quite a bit newer than this story. 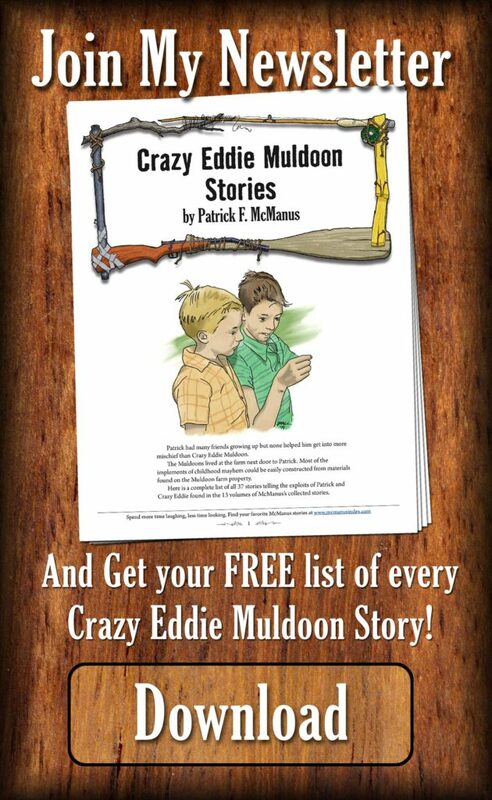 If this story is included in one of Patrick’s books, please let me know so I can get a copy. Hi Dave, Pat wrote about the Chick-a-nout Narrows in a couple stories. “Shooting the Chick-a-nout Narrows” in the book A Fine And Pleasant Misery, and the story “Whitewater Fever” in the book The Night The Bear Ate Goombaw. Is there a story that possibly features patience? There is one story that is specifically about patience. It’s titled “A Dimple in Time” and is found in the book Kerplunk! Glad I could help! Looking for “No good deed undoes”. Haven’t been able to find it any place. It is about Rancid showing the boys how to do the toboggan run they had set up. Hi Les, that story is titled “A Good Deed Goes Wrong” and is found in the book Real Ponies Don’t Go Oink!